රණසිංහ ප්‍රේමදාස මහතා 1993 දක්වා රටේ ජනාධිපතිවරයා වී සිටියද ඔහු දේශපාලනයට පැමිණිමට පෙර රැකියාව ලෙස කලේ පදික වේදිකාවේ ලැවරිය විකිණීම වුවත් ඔහුගේ පුත් සජිත් ප්‍රේමදාසට අද වන විට පියාගේ මිය යෑමේන් පසු කෝටි ගන්නක දේපල මෙන්ම මුදල් ලැබුනේ කෙසේදැයි සැක සහිත බව අල්ලස් හා දූෂණ විමර්ශන කොමිෂමට පැමිණිල්ලක් ඉදිරිපත් කිරීමට නියමිත බව සඳහන් වෙයි. පසුගිය මැතිවරණය දක්වා දිවයිනේ සෑම ප්‍රදේශයකම ඇමති සජිත් ප්‍රේමදාස විසින් අත දිග හැර විශාල වශයෙන් මුදල් පරිත්‍යාග කල බවට තොරතුරු එම පෙත්සමට ඇතුලත් කර ඇතැයිද සදහන්ය. party been investigated? Never. So lk alugosu porisada’s loot is safe. Yes. Most definitely this is BLACK MONEY. 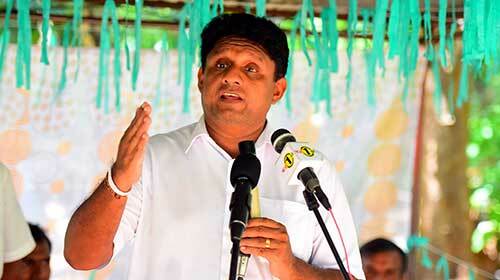 Rajapase himself siad he “ALLOWED” or “LET GO” the case of black money owned by Premadasa’s daughter. He should be punished for “LETTING GO”. There is an understanding among PAL HORU not to harm each other, according to MY3Pala, RW etc. This must come to a STOP. This the ROOT CAUSE of our country going to Indian Vermin Empire. We cannot stop the empire, but we can kill the REAL PARASITES. Lanka Con News doesn’t publish the “full report”. I also says, Colombo Telegraph reliably learns that there are many other petitions currently being compiled for submission regarding other politicians currently in service.. I am sure Con News owner WW is also under investigation how he earned his massive wealth. Whether the father was a wealthy man or not will not make one honest. How about Ranil then ? Rajapaksas too were NEVER RICH as what the possess now. Look at the nuber of companies owned by sons, relatives , brothers and “owner less” palaces and even TV Channels now they claim “not theirs”. Almost all politicians are PAL HORU. We should construct a society in which “Laveria” selling man can become a millionaire surely by working hard, if such man can become the President.